Find Easter crafts, Easter arts and craft projects and Spring crafts for kids. Easter is a one of the most awaited festival celebrated by Christians. People all over the world celebrate it with great dedication and devotion. During this occasion, people clean every nook and corner of their house and beautify it by making use of attractive decorating items. There are loads of decorating materials available in the market these days. However, if you want to add personal touch to your home decorations, then create beautiful things on your own. So, what are you waiting for? It is the best time to let your imagination and creativity flow out, through Easter craft. 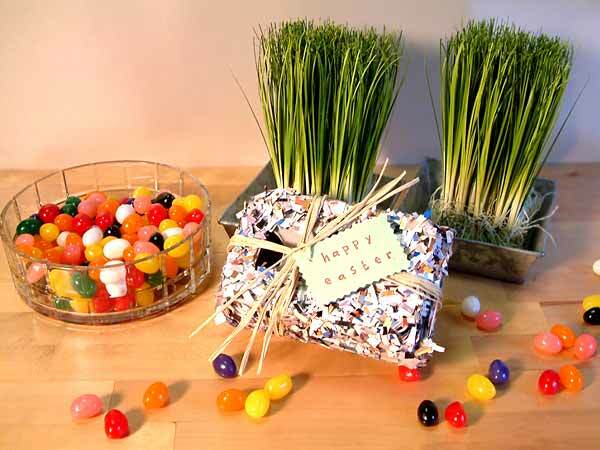 Easter crafts would help you to celebrate your festival with the required festive spirit. Easter crafts are fun projects to keep kids busy during their holidays. Make sure that Easter arts and craft projects point out the history of the festival and focus on the symbols related to the ceremonious occasion as well. Easter eggs and bunny are two of the most popular Easter symbols that are adored by children. Colorful Easter crafts can make interesting family activity and an opportunity for parents to spend quality time with their kids. You can together make interesting artistic items for different purposes, such as personal use, decorating and gifting. In our related section, we have discussed about some of the Easter crafts, which can surely help you decorating your house this Easter. Easter is celebrated with great dedication and devotion all around the world. On this occasion, people exchange gifts and wish their loved ones with good health and prosperity. One can find different kinds of gifts in the market, around Easter, suiting almost every pocket and choice. Colorful reed baskets are wonderful gift items. Colorful wood stains and painting can make your reed baskets look even more beautiful and chic. You can put flowers in the baskets and use them to decorate your front door. You can also use colorful reed baskets as a table centerpiece. They can also be used for holiday and festive decoration. For moms who love gardening, there is nothing better than a decorative pot to adore the look of their garden. Easy to make, these decorative pots become excellent class craft projects for young children and gifts for moms. Though the beautification done on the pot is extremely attractive to look at, the message written on the pot definitely steals the show. Easter bunny pom-pom pencil makes the perfect Easter craft for kids. The Easter bunnies look cute and are very attractive. This is a good craft, because it is very easy to make. Moreover, the materials needed for the same are easily available in the market. The craft can be personalized, depending upon the gender and taste of an individual. Gifts packed in beautiful baskets look very attractive. There are various kinds of decorated baskets available in the market that you can use for the purpose. However, have you ever thought about making these baskets on your own? If not, then do so now. Packing the gifts in handmade baskets will surely give a personal touch to them. Royal Easter eggs present an interesting craft, which is also easy enough to be made by kids. They can be presented as gift to your friends and relatives on Easter or to your mom on Mother's Day. These royal decorated eggs can also be used as table centerpieces for Easter dinner.